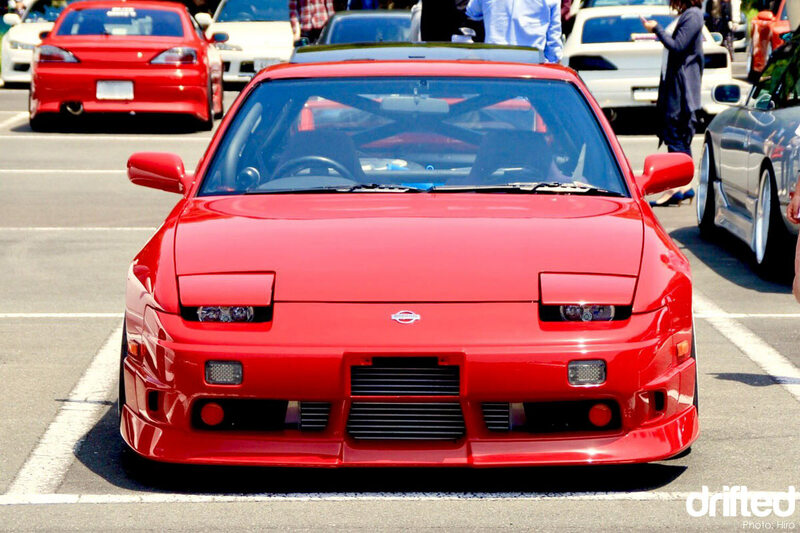 Welcome to a master class in Nissan’s 180sx. 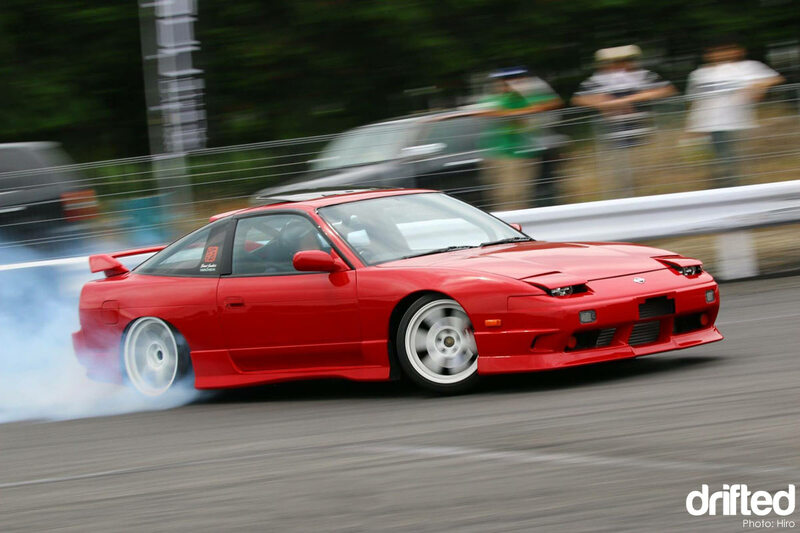 Drifted presents – Hiro’s Japan born Nissan 180sx drift car. 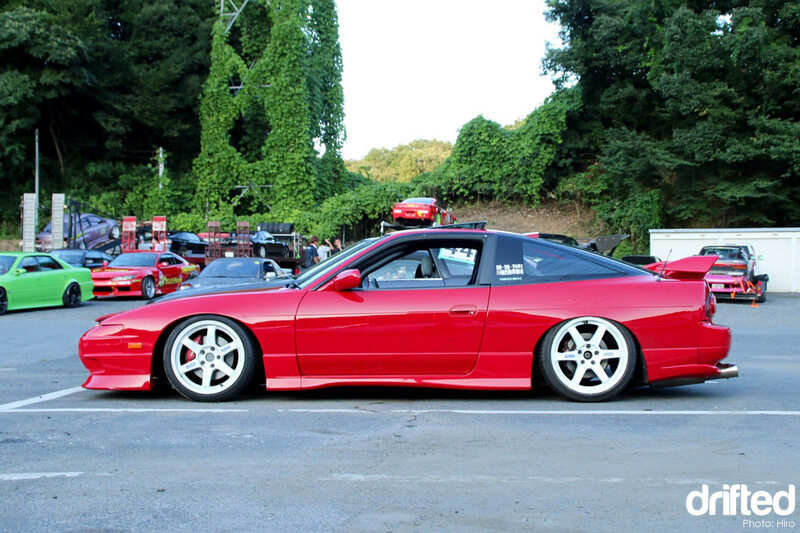 As a long time s13 enthusiast (and previous 180sx owner) I knew it was something special when Hiro’s 180sx popped up on my social feed. This car codifies the early 2000 JDM style that so many of us love. You could call it OEM+ but with a little more attitude. This car could drive onto the Hot Version set and look right at home. Okay I’ll stop gushing and get on with the details but just before we dive in I would like to thank Hiro-san for allowing me to share his car with you all. 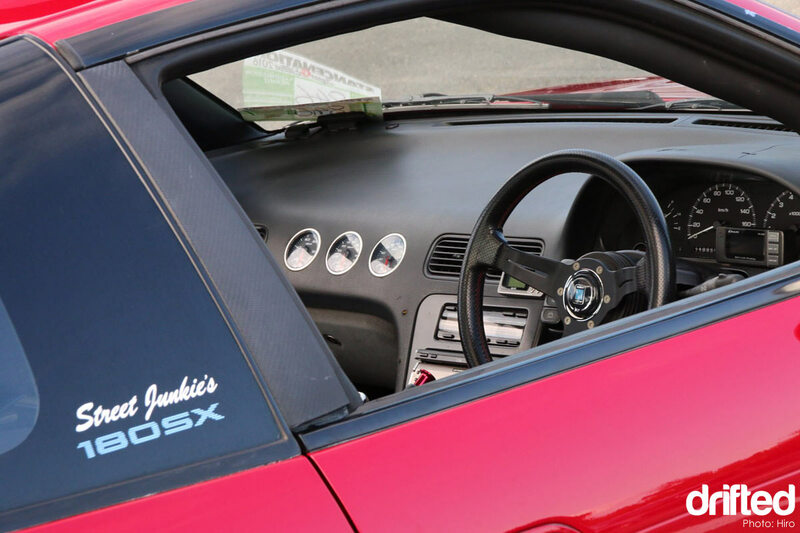 Hiro-san hails from Japan and has owned this car for many years, he bought it as a 1991 base model but over the years he has built it up into the extensive specification you can see in the pictures. He uses this car as both his daily driver and his track car. It blows my mind that he is happy to drift a car this clean but he does. Hiro we salute you! 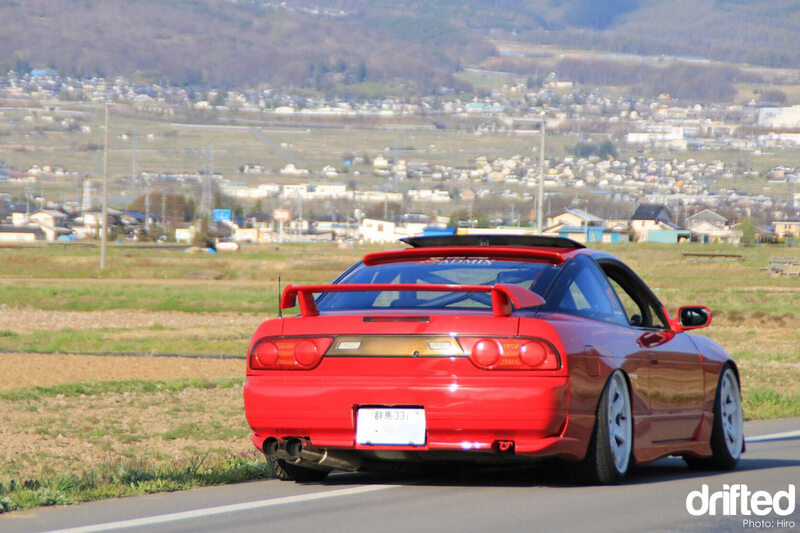 Check out this video of Hiro shredding some tyres around Japan’s Nikko circuit in his immaculate 180sx. Let’s start with the heart of this 180sx; a highly tuned SR20DET twin cam sits under the stock bonnet. Hiro-san had the whole engine rebuilt with forged pistons and a total rework of the cylinder head. This is fastened onto a metal head gasket. Moving outside the block you’ll find a low mount exhaust manifold with a TRUST T518Z turbo charger. The twin can exhaust system is 3″ all the way back and has a cat bypass pipe. On the cold side you’ll find an aftermarket intake kit and a large front mounted intercooler. For the juice an upgraded fuel pump resides inside the fuel tank and larger aftermarket injectors feed the engine high octane fuel. An HKS F-CON V Pro ECU holds the tune that keeps everything in check. The result of these modifications is 400ps at the flywheel (55kg/m). 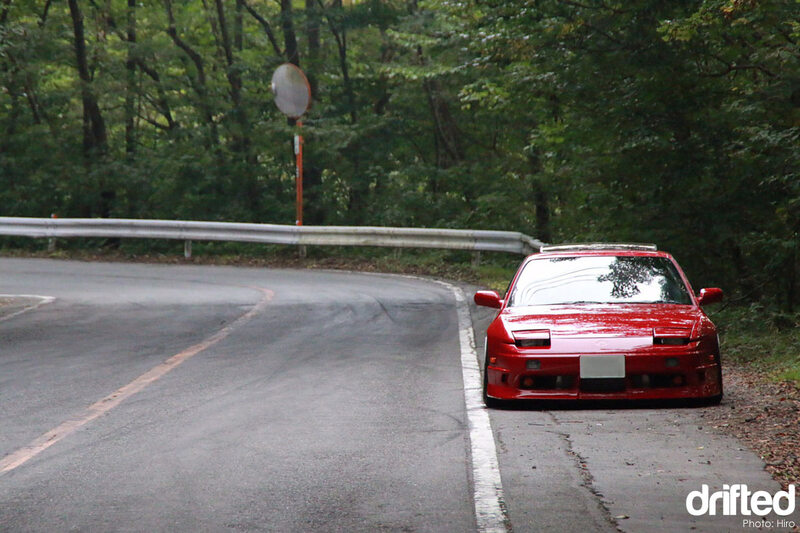 This power figure in a car as light as an s13 makes for rapid performance. 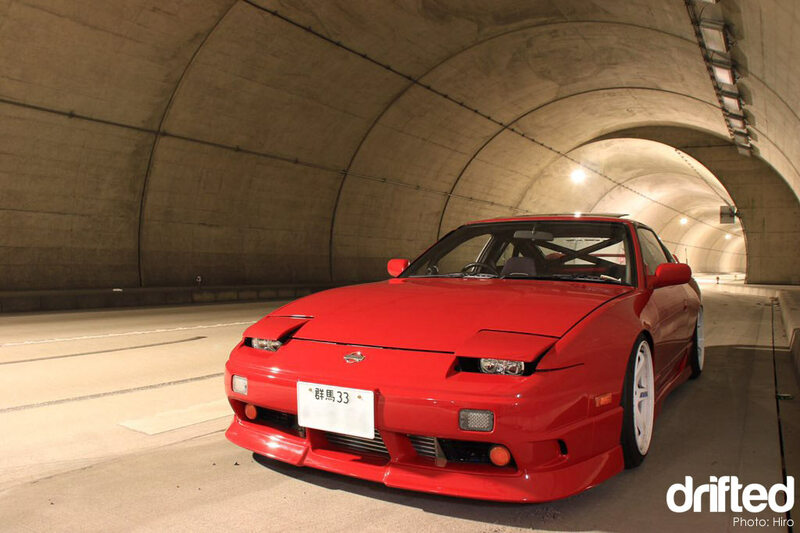 Looking at the exterior of the car the first thing you will notice is the stunning Nissan ‘Super Red’ paintwork, Hiro-san had the car re-sprayed in 2015 as a few drifting battle scars were letting the car down. 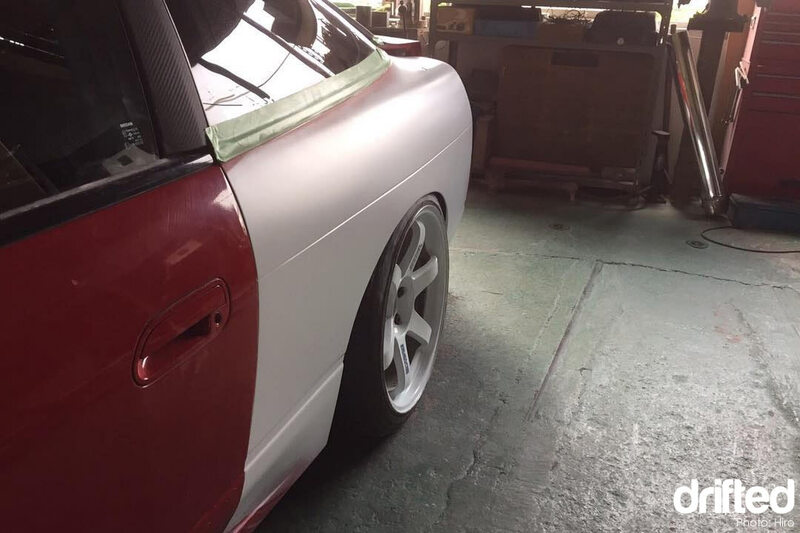 He added aftermarket +20mm rear overfenders which he had smoothed into the body. He had the bodyshop fit a complete Type X aero kit including front bumper, side skirts, rear bumper, rear spats and rear wing that he had been stock piling over the past couple of years. A rare carbon rear garnish and Kouki tail light set complete the rear end. He also added a subtle roof spoiler to add a little more drama to the silhouette. Hiro didn’t specify the tyre brand as he said they tend to get shredded by the power plant and his heavy right foot.. Under the arches sit a classic s13 wheel of choice; a set of immaculate Volk TE37’s in white with blue decals. These wheels are rolling on 17″ tyres at the front and 18″ at the rear. Wheel widths and offsets are F: 9j ET +22 and R: 9.5j ET +12 respectively. Hiro didn’t specify the tyre brand as he said they tend to get shredded by the power plant and his heavy right foot..
Underneath the car you will find a set of HKS fully adjustable coilover suspension with a complete roster of adjustable arms to compliment. Strut braces have been fitted to both front and rear of the car. A Nismo 2-way differential finishes the undercarriage. Popping open the door you will find a complete interior and it is in great condition. 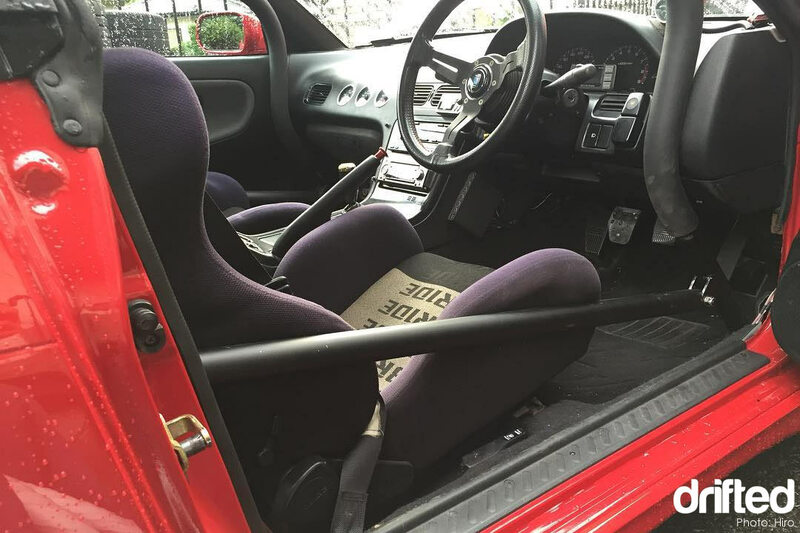 Hiro-san has updated this to include a Nardi steering wheel, Nismo shift knob, Defi gauges and a fly off handbrake. A pair of immaculate Bride Brix recliners invite you in to the cockpit and a six point bolt in roll cage is located where the rear passengers would normally sit. 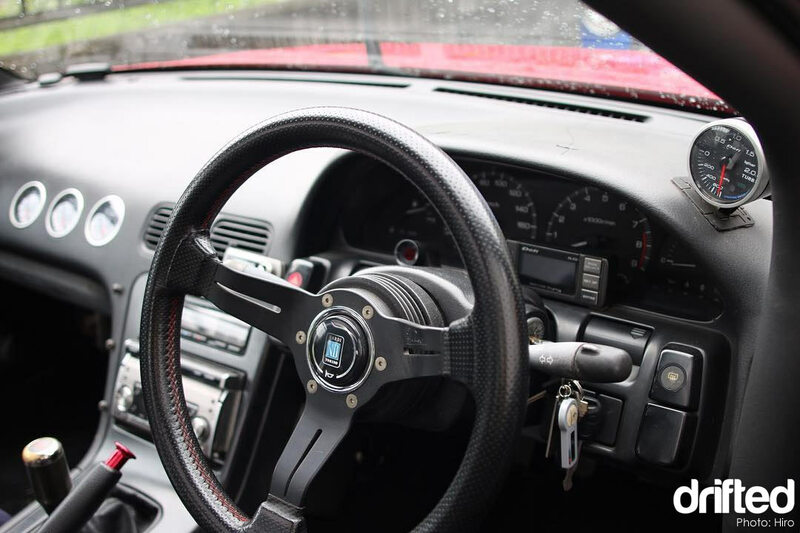 A Defi boost pressure gauge shows Hiro how his turbo is performing and a beautiful leather Nardi Deep Corn steering wheel improves the feel of the car. 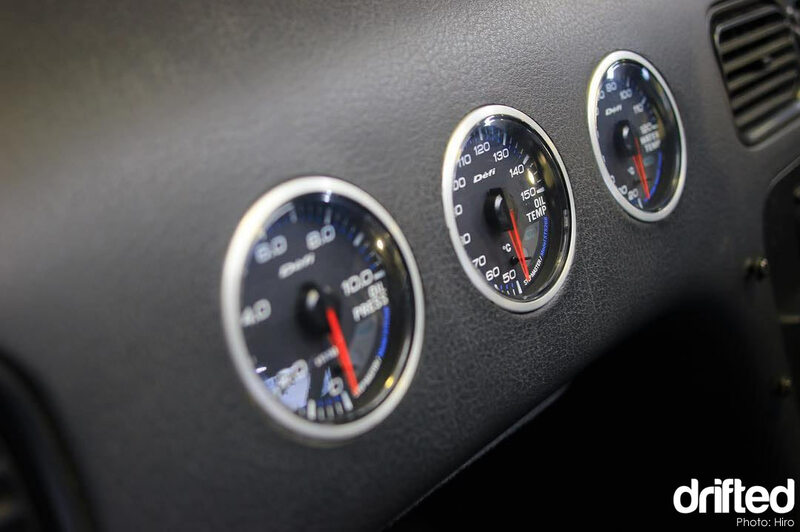 A set of Defi engine oil temperature, oil pressure and water temperature gauges make sure that Hiro can keep his engine health in check when pushing the car hard. These are great tools to help prevent an expensive engine rebuild. From inside out Hiro-san has built a beautiful, well balanced car that fits all the roles he needs it to. 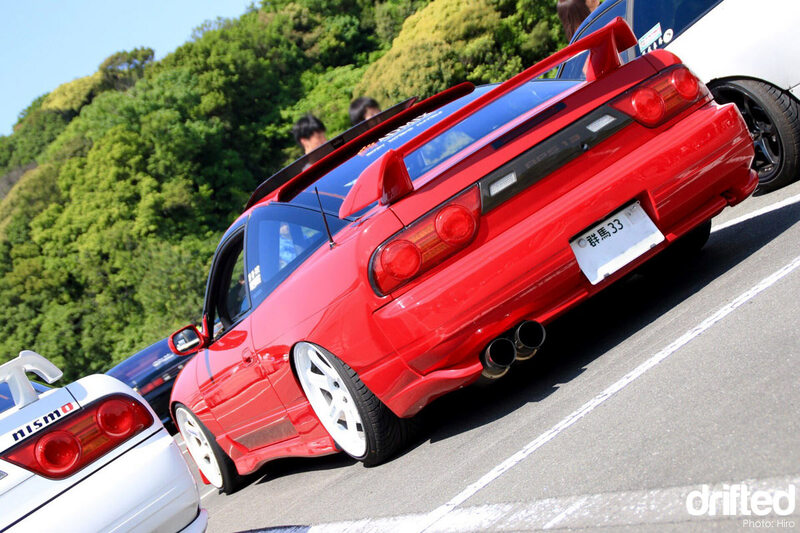 Tasteful daily driver or tyre shredding monster – Hiro’s 180sx is extremely capable at both roles. 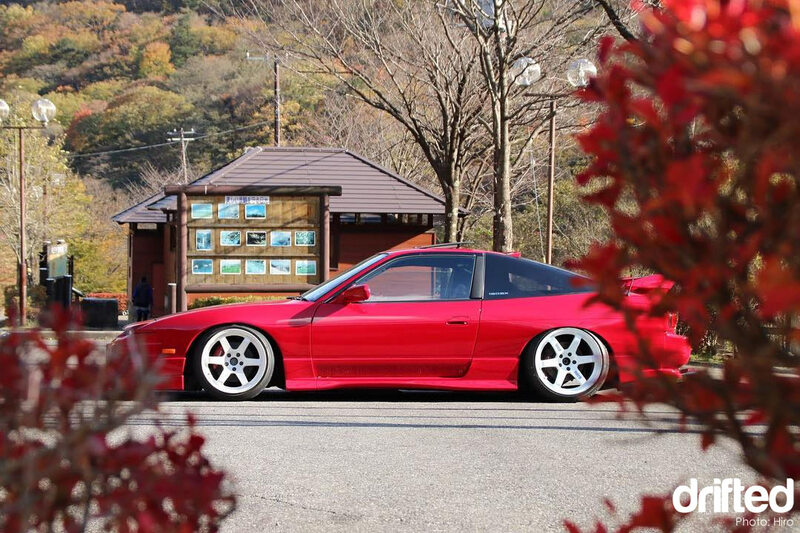 Thank you again for sharing your 180sx with us Hiro, let’s see where you take this project next! If you guys enjoyed the article please let us know in the comments below. If your feeling extra generous share this article using the buttons up top. You can learn more about the SR20DET with our SR20DET Specs article. You can also learn how to properly tune your own SR20DET with our SR20DET tuning guide. Looking for a turbo upgrade? Our SR20DET turbo guide has you covered. « DRIFTING VIDEO: Parenting done right!